When you turn 18 in Ottawa, where you have your birthday dinner matters. Last night we headed to Sterling Steakhouse and Seafood Restaurant at 835 Jacques Cartier Road in Gatineau. The operative word being Gatineau. The location is picturesque as the very large heritage home is located directly across the road from the Outaouais River. And as the evening sun was coming down, we could see the Ottawa Rowing Club out for a practice on the water. It was not a busy night and we were brought upstairs to a table nestled in by a large window with an arched architectural detail. The ceilings are tin and high. Large modern chandeliers lit the room. This large room also has a showy raised fireplace. No need to be near that last night. To one end of the second floor, there is a room separated from the main area by a wall of windows and french doors. It was occupied by a large group for a dinner and work meeting. It looks like the perfect place for a private reception. Marc was our server and he was attentive to every detail. 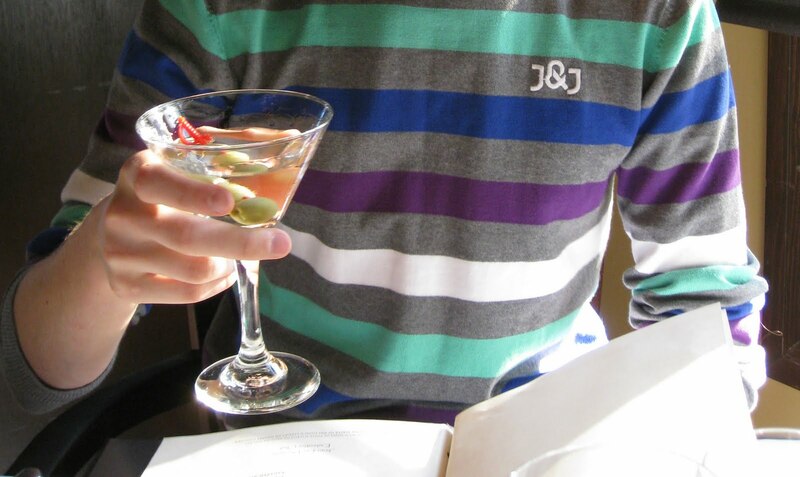 It was on his suggestion that we started off with a celebratory ‘James Bond’ vodka martini! We were first served some slices of warm, delicious baguette with butter. Great bread at dinner is always a problem. It is so hard to stop once you have had that first bite! 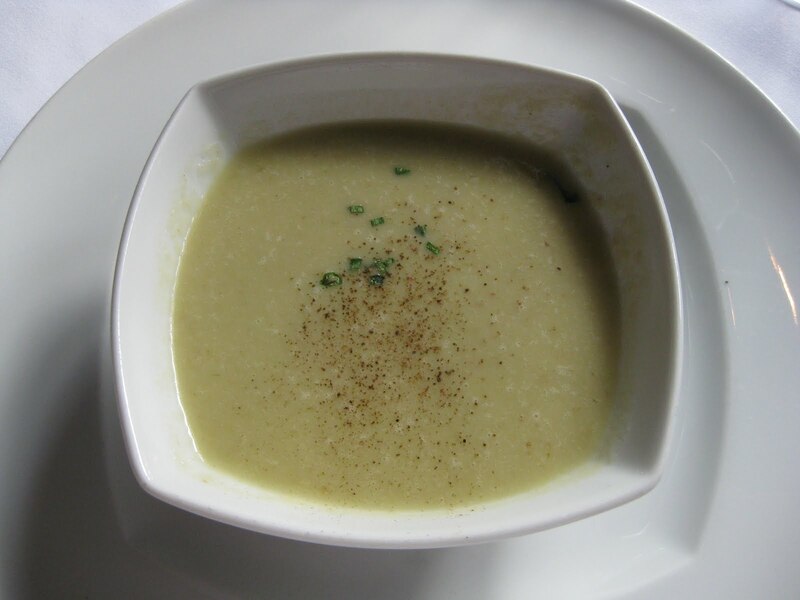 Those having the table d’hôte started with a white turnip and asparagus soup. The taste of the asparagus was tucked in behind the bold turnip flavour and everyone agreed that it was excellent. 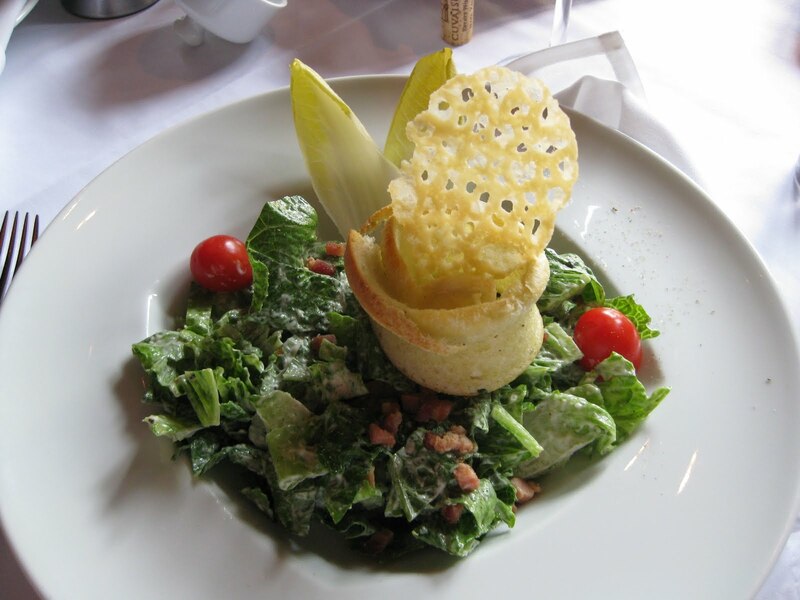 We then followed with the Sterling Caesar Salad which had very fresh romaine lettuce, warm lardons, a Parmesan cheese crisp and a garlic crouton roll. It was a tasty salad. No objections. I personally like mine with more garlic and more lemon. This night we were going to be eating the highest quality of beef in Canada. Sterling Silver, grilled over maple wood. 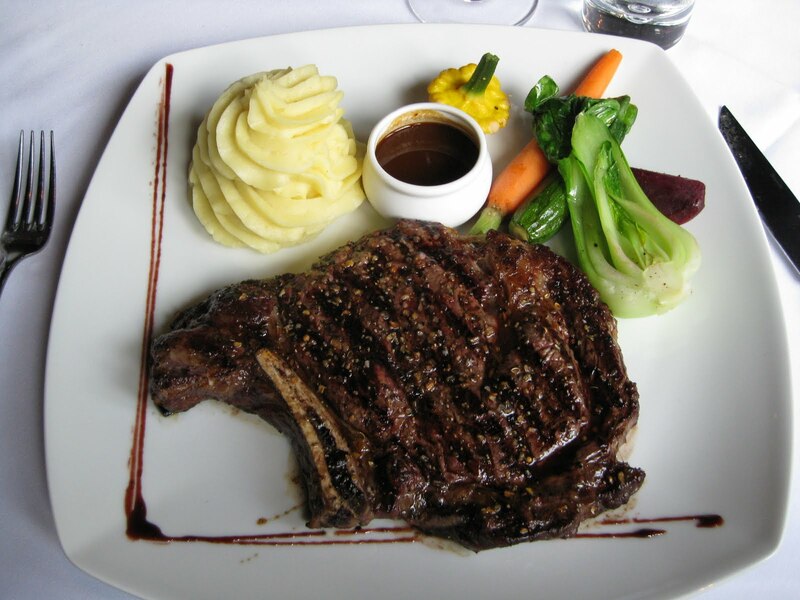 The meat is aged from 21 to 40 days. Only 2% of the meat raised in Canada is classified as Sterling Silver. Those doing the table d’hôte had a beef tenderloin that was about 8 ounces. 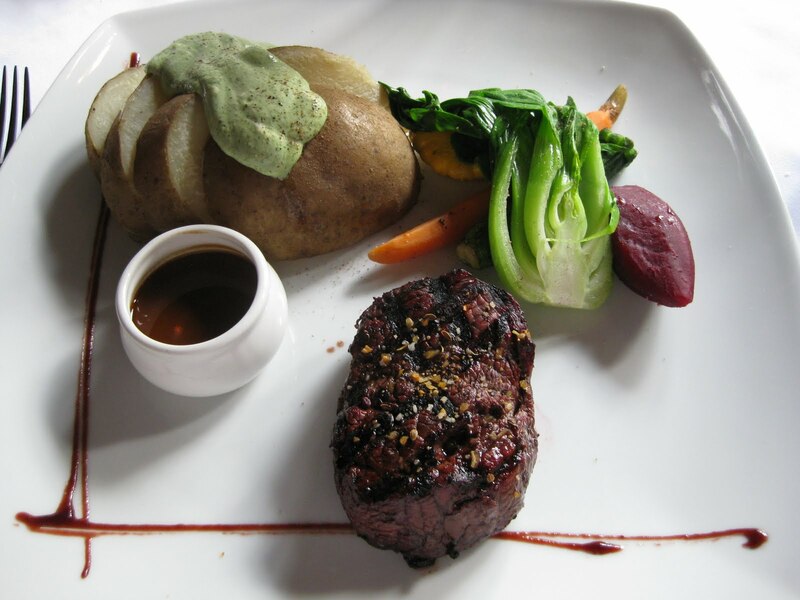 It was served with a two peppercorn sauce (a mix of green and pink), a baked potato with herbed sour cream and then some steamed vegetables. I love getting bok choy. I prefer my beet and carrot just a bit softer. As I was filling up, I found the potato didn’t grab my attention enough to keep going and so I left it. The Papa’s Cut was 20 ounces. The sauce was called Perigourdine a mix of smooth truffle and foie gras. The Yukon gold mousseline potatoes had a hint of garlic. So fluffy. I stole a taste and wanted for more. Again, the same steamed vegetables. The wine list is extensive. I wasn’t involved in the actual wine decision but I have to say that those who were got it bang on, despite missing out on our first and second choices. Somehow that seems to speak well to the depth of their selection. Our final pick – a 2006 Cuvaison Syrah from the Napa Valley. I loved every sip. Unfortunately, I won’t be finding it at the LCBO. The chocolate dessert that came with the table d’hôte came home with us to augment our offerings for our ‘after party’. As we headed out, Marc kindly took us into the wine cellar for a look and an introduction to some of their finest wines. We aren’t regular steakhouse people, but last night we needed one to serve a birthday wish. The birthday guest said it was the best steak he ever had. Mission accomplished. The setting is lovely. It is clear that attention to service is their motto and Marc was memorable. 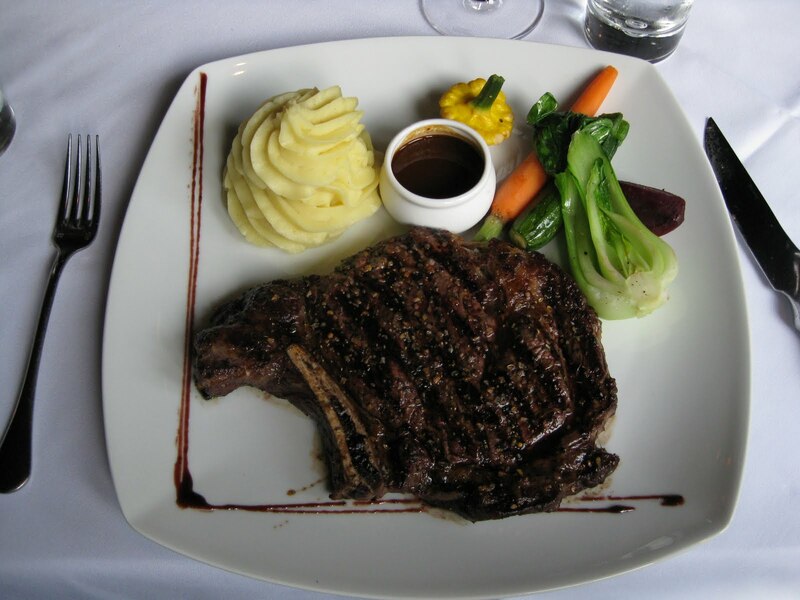 So if it is a steakhouse you are after, you will find what you are looking for at Sterling’s. An easy trip over the river.